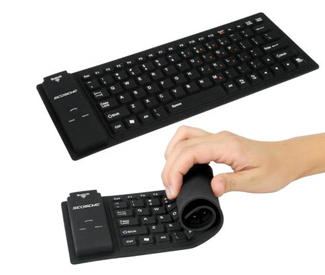 Scosche freeKEY Water Resistant Bluetooth Roll-up Portable Keyboard - Compatible with ALL Bluetooth HID profile enabled devices and cell phone models. FEATURES: Water-Resistant Silicone Keyboard - Silicone construction also prevents keyboard slipping when typing. Easy Set-up, no technical knowledge is required. Bluetooth version 2.0, Class 2 device, HID profile - The HID Bluetooth profile permits "Out of the Box" Alphanumeric compatibility with many products including Tablets, PCs, Laptops and many PDAs using the HID Bluetooth technology. HID Bluetooth Profile for connecting to Human Interface Devices via Bluetooth, is the most common profile used for PDAs, Smart-phones, Laptops, PC s etc. Automatic Reconnect Rechargeable Lithium battery operated - Allows Continuous operation for up to 80 hours, or turned off for up to 1 year before you need to recharge the battery with the INCLUDED retractable USB charging cord.